Here are seven useful social media post ideas that will help keep your audiences engaged and interested. Content marketing and social media posts to that end need to be interesting, entertaining and valuable for your audience. Use these seven different post ideas to help win the game. The following post ideas help you with adding a bit of variety and getting and holding attention. Social media is an opinion platform. Ask your audience questions and seek responses. This kind of a post empowers your audience to share their opinion. It gives them a sense of social pride. Experts tell us that posts with questions usually get 100% more comments than standard posts. Posts with questions will reward you with more comments but tend to get fewer likes and shares. You might ask a question not just about your brand or product, but one that helps your social effort "How many posts a day would you like to see from a brand on Facebook?" One other way is to seek fill-in-the-blank responses to your posts. Again this is opinion seeking, and gets a fair amount of participation. You can always use information you gather for your future content or on how to improve customer service or even product attributes. "I buy my weekly grocery products on _______________ (day of week)". "I watch my favorite programs on _____________ (cable tv, streaming, etc)"
Jump on what's trending in your category or industry and comment on it. This is side step from your social calendar, and it sparks interest and attention right away. Make sure you do a quick daily research to keep up with what's happening around. Include related hashtags so others easily can discover your content. Proper use of hashtags improve engagement and get attention. Issues and trends around your business usually has the most impact. You can of course jump on a huge trend that's outside your realm, as long as you can tie it in with your brand topic somehow. Advice, tips and How To posts get a lot of shares, because people like to be seen as 'useful' to their circles. Advice posts are an opportunity to often re use older content. You also can curate content from other sources, which can position you and your brand as the go-to source for information on the subject. Promotions and offers are a great way to keep your audience interested in your posts. Statistics show that 35% of fans follow brands to stay updated on promotions. And 42% follow a brand on social for discounts and special offers. This is how you make your content 'valuable' – literally. Remember not to be spammy with now-or-never deals and cheap offers. Promotions should seem exclusive to your audience and provide a genuine sense of value. Global research giants Nielsen tells that today's consumers trust user generated content about a brand 92% to 36% when it is directly from a brand. If your fans post content that features your products, share it! Ask your audience for content. Social media is really a great user driven platform, so seek that participation and contribution. Look out for user reviews, unboxings, How To's, product tips etc posted by people and use them in your content. Platforms like Snapchat, Instagram and Facebook’s native and live-video options mean sharing video never has been easier. Don’t forget that consumers who view video are twice as likely to make a purchase. A study from Invodo also showed that 92 percent of mobile video users share with others the video content they see. Did you know photos get 53 percent more likes, 104 percent more comments, and 84 more click-throughs on links than text-based posts? Photos enable you to tell a story visually, and your audience will not only be attracted to see the posts with photos but also share them if they are 'useful'. Research tells us that there are certain words that win over audiences in content. Google "power words for content marketing" and you'll find dozens of great articles on which power words to use. Use them appropriately in your posts and build these winning words and phrases into your post content. Words paint pictures, and certain words paint better pictures. These are seven easy tips to follow. 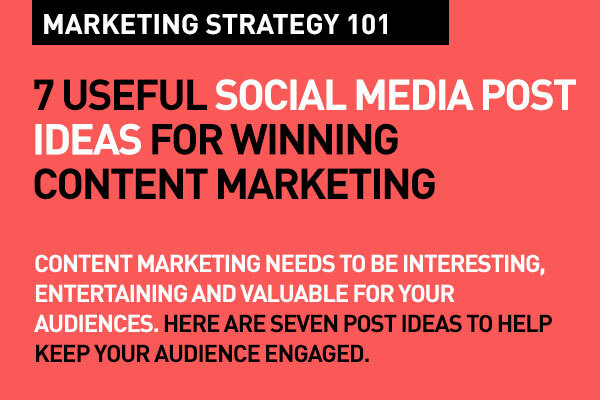 Empower your posts to ride on the power of a winning content strategy for your social media marketing. And that's the basics of digital marketing strategy. That's 101. Please share this post with your friends and colleagues today... And do comment if you feel you want to add to this. • Content Marketing Strategy: What kind of content should you create? Useful ideas here, and simple to remember. I did not see mention of polls and contests? Really nice. And even when we are posting with more ideas something related to the digital marketing will let the people to know more which helps to stay strong in their desired field. So please keep update like this. This post is very good useful info. I have found so much interesting stuff in your blog especially its discussion. great article & Keep it up. Very Useful information Thank you!! East Coast, France, Luxembourg, Germany, India, Taiwan, South Korea and Japan. Engaging AD formats offers a great experience to audiences on facebook, It helps brand in connecting with customers.It is important to discover techniques to optimize mobile-friendly websites and leverage social media to drive organic SEO traffic. Fixx Group is one of the leading and developing Website Design and Development ,Mobile Application Development Company in Bangalore with a specialist management and expert group. Thank you for sharing such valuable information and tips. This can give insights and inspirations for us; very helpful and informative! Would love to see more updates from you in the future.